TX87/73 Swing bridge and the Bridge City Swing bridge pages. 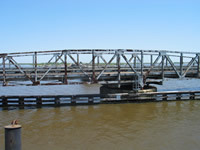 The TX82 swing bridge is located on the border between Texas and Louisiana at the mouth of the Sabine River (Sabine Lake). 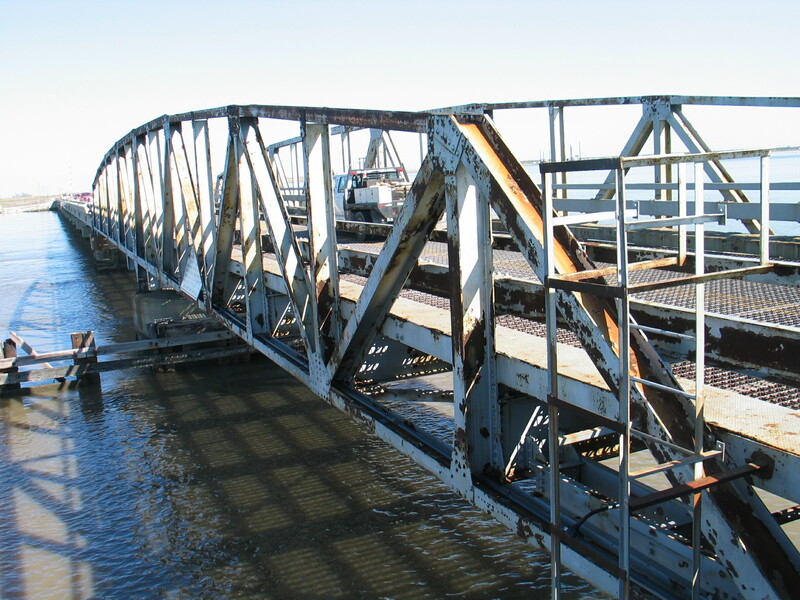 The operator's shelter is the best condition of all the swing bridges. It is equipped with an emergency generator. 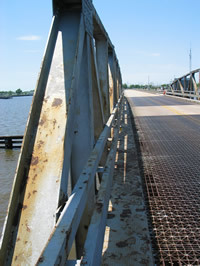 The swing bridge was damaged from Hurricane Rita. 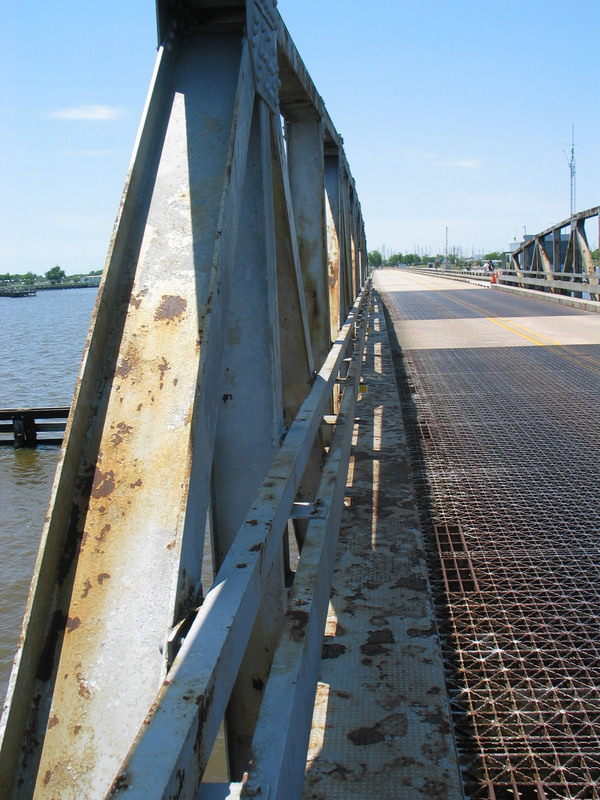 It was repaired, but TxDOT has decided to replace the bridge. When replaced a piece of history will be lost. 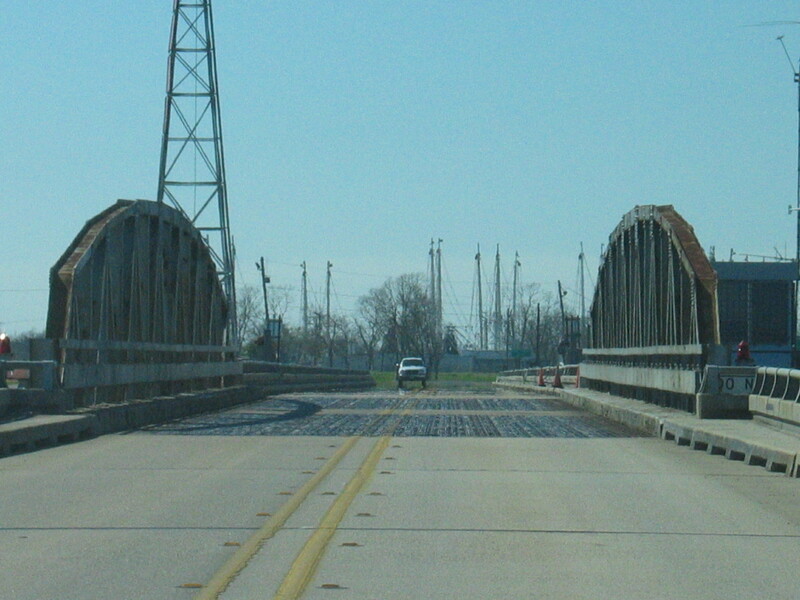 This photo was taken prior to Hurricane Rita. Notice that the gate arms are still attached. Here are a couple of images to help gain an overall perspective of the location of the swing bridge. Texas is to the southwest, Louisiana is to the northeast. This video captures the opening of the bridge. The video was taken from the northeast corner of the platform for the operator's shelter. This video of the bridge opening was shot from the center of the west side roadway. You can see a boat go through the open bridge. This video of the bridge closing was shot after the Video #1 sequence.. 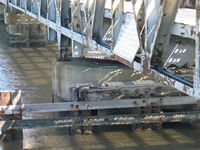 Here we have a close up of the bridge closing. 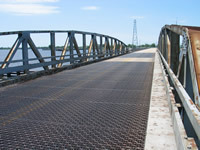 You can really see how close the tolerance is between the bridge and the roadway. This is a composite view created by stitching together a series of long range photos. The approach from the Texas side. 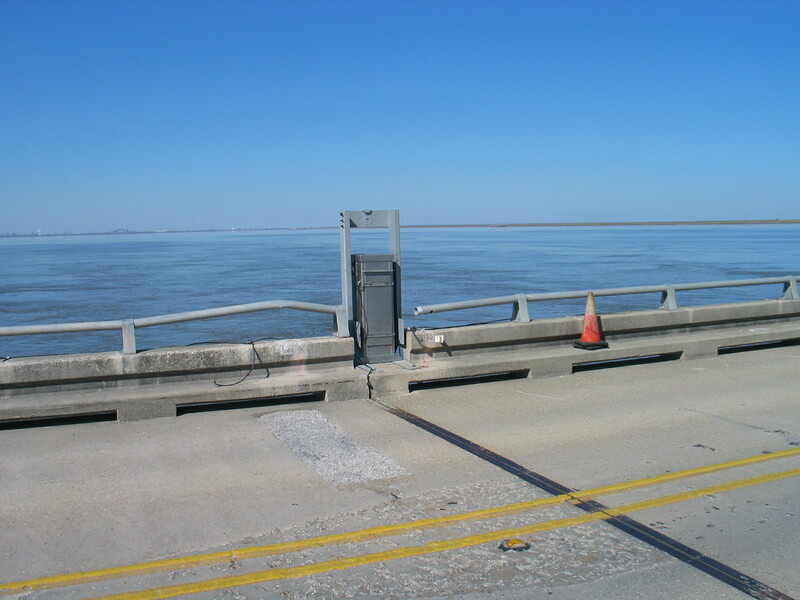 A look southwest from the Louisiana side. Looking from a boat ramp on the west bank. Looking west from the eastern gates to Texas. The west gate mechanism. The arm was destroyed by Hurricane Rita. 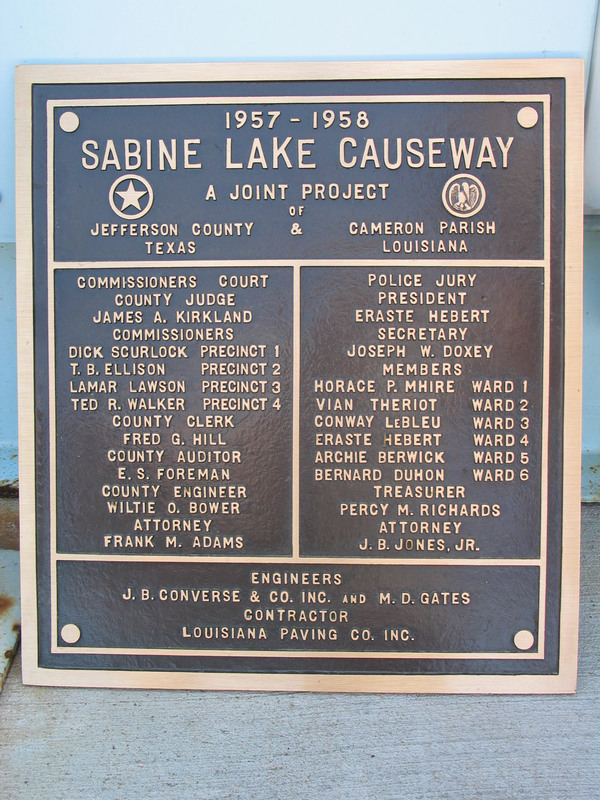 As of April 28, 2007 it has been replaced. Looking at the west seam from the south side across the road surface. The curve in the joint can clearly be seen. Notice the very narrow clearance for the bridge to swing. A side view of the west seam, looking south. The pivot column and mechanism. Standing on the north shoulder looking east. Standing on the south shoulder looking east.. Standing on the platform for the operator's shelter looking east. 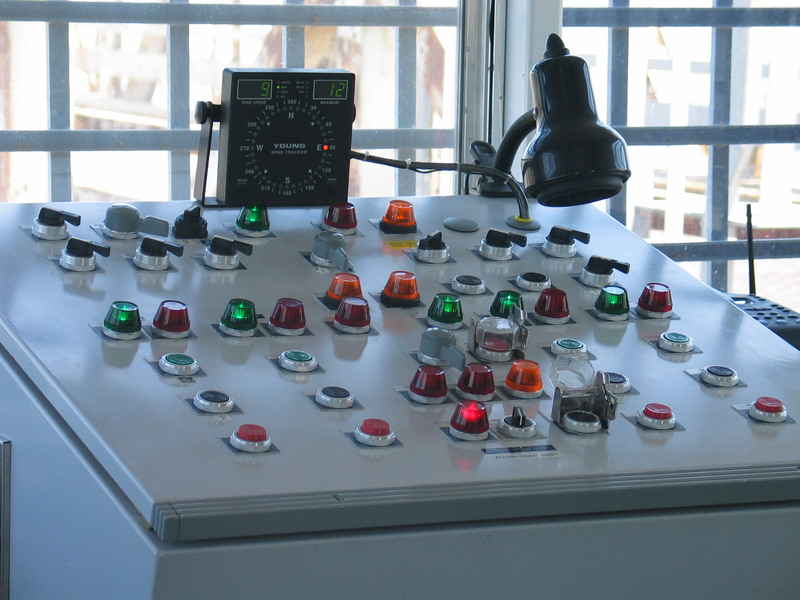 Here is the operator's control panel. The gauge at the top is for wind direction and speed. A closer look at the grating. 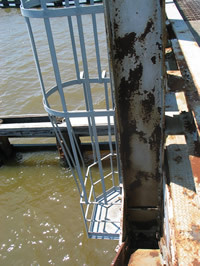 This ladder cage is for accessing the drive equipment which turns the bridge. 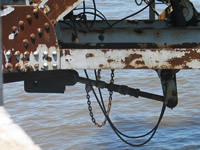 This "pin"is used to turn the bridge manually in case of power failure or some other condition which would prevent the drive system from turning the bridge. 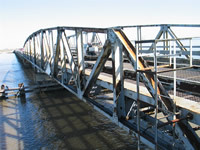 To open (or close) the bridge manually takes roughly an hour per direction. 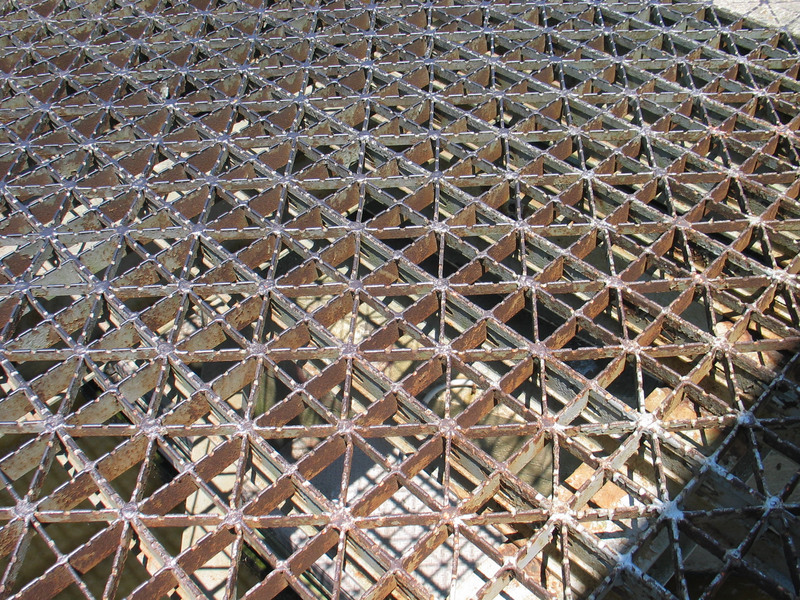 Notice how the grating in this section of the bridge has been filled with concrete. This is done to provide some rain protection to the drive system below. 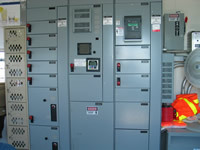 This is the motor control center which provides power to all of the electrical equipment associated with the bridge. Standing on the north shoulder looking west into Texas. Looking at the swing bridge while open we can see that the pivot column is not centered under this bridge, but offset to allow for a wider channel for boat traffic. 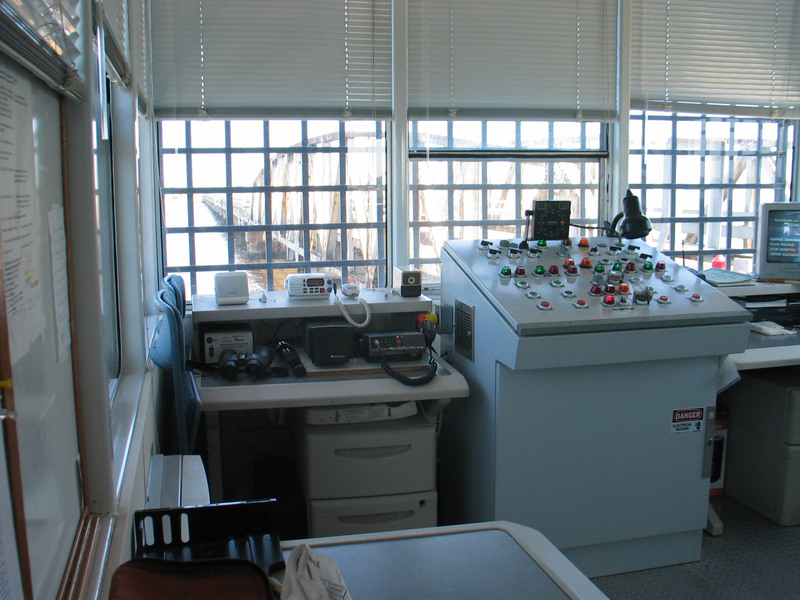 A wider view of the operator's area. You can see the swing bridge through the windows. 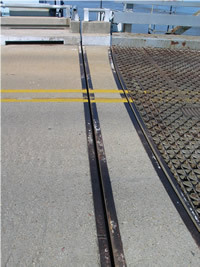 A "wedge" is a device which holds the bridge in place and keeps the end(s) from moving while vehicle traffic goes over the bridge. 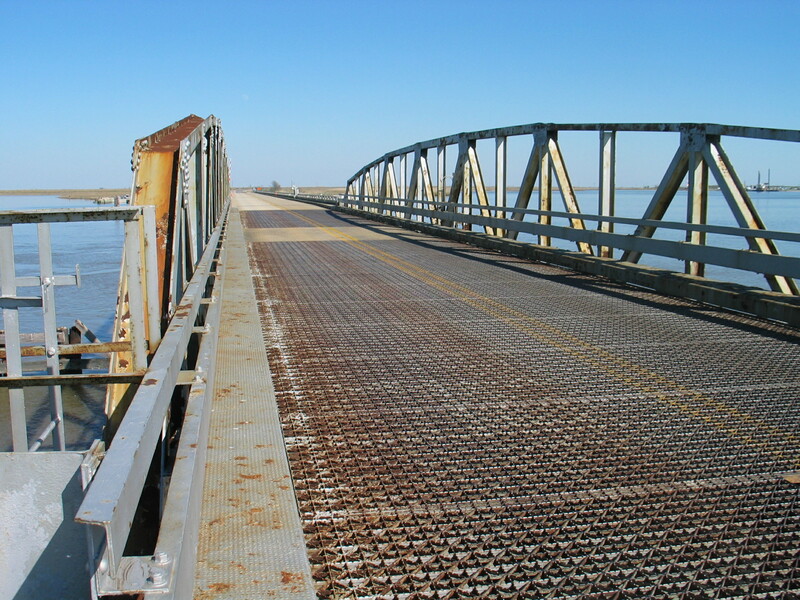 Each end of this bridge has two wedges. This photo shows the upper section of the mechanism which insert or retract the wedges. The wedge has been retracted for this photo. Here we see the lower section of the wedge mechanism. This section has the actual "wedge". 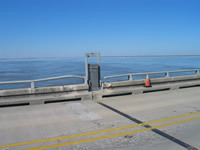 A driver's view approaching the gates going to Louisiana.